During public health emergencies, partnerships between pharmacies and health departments have become increasingly useful to improve access to medication and vaccines. Through collaborative emergency planning efforts, pharmacies and health departments can enhance accessibility of medication and vaccines to targeted populations. One way to formalize partnerships is to develop and implement collaborative practice agreements (CPAs), also known as collaborative drug therapy agreements (CDTAs) or collaborative practice protocols (CPPs). During an emergency, a local health official may issue a CPA, allowing for medication dispensing without prior visitation or consultation by a patient with a physician. This issuance is a critical component for coordination that can reduce burden on the healthcare system during an emergency. 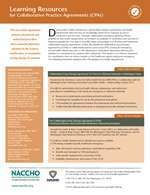 This one-page flyer highlights available resources for CPAs.